A recent trip to Chicago found me losing my mind over records. Those who know me would say I always lose my mind when it comes to records, but for me Chicago seemed to be an extra special case. For one, it seemed that Chi Town had a disproportionate abundance of solid soul and jazz records. And if that weren’t enough, the records seemed fairly priced. . .for a change. So, it was easy to go bananas while buying records in Chicago. Ok, I’ll stop saying records. Of all the musical treats I brought back from my trip, this forty-five (which cost me 50 cents, not bad eh?) has been getting the heaviest play. The story of the Chicago-based Impressions is very much linked singer, songwriter, and producer, Curtis Mayfield’s success-Mayfield was one of the first members of the dynamic group. The Impressions got their start in 1958 as a doo-wop group called “The Roosters,” but over the years they would also sing gospel, soul, and R&B. In the 1970′s Mayfield left the group to start his own label, Curtom, and pursue a solo career. He didn’t forget the Impressions though; Mayfield would sign them on to his label and continue to write for the group. 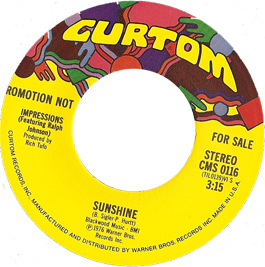 “Sunshine,” a later Impressions release was never a super-hit, but it’s a Curtom classic in many ways. This subtle ballad is vintage Mayfield songwriting. The smooth vocals show the Impressions doo-wop and soul sensibilities and the warm organ that kicks in mid-track is a nod to their gospel roots. So for that end of winter stretch, here’s a Windy City classic. A song for lovers and a hopeful prayer for sunnier, spring days. This entry was posted on Tuesday, February 10th, 2009 at 2:50 am	and is filed under Uncategorized. You can follow any responses to this entry through the RSS 2.0 feed. You can leave a response, or trackback from your own site.